People write . . . .
Owners write independently about their experience with the Beveridge speakers. Although few of them know each other personally, much of their intimate stories sound pretty similar. Del Tricia Arthur Bob M.
The speakers continued to work for 18 years after being in a fire! I can't thank you enough for the great job you did when refurbishing my System 3 transducers. As we discussed before I sent them to you, they were in a fire 20 years ago. 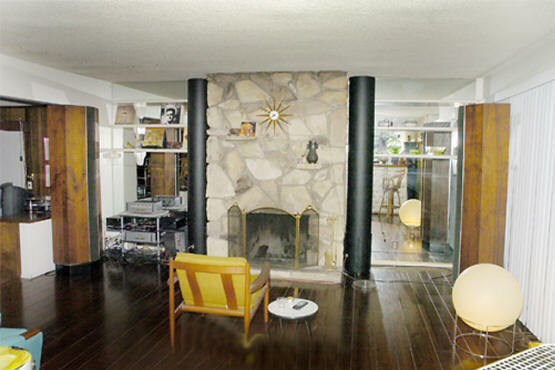 That they continued to work for so many years after the fire is a testament to the robustness of the original design. The manufacturers of some of my other "high end" components refused to even consider restoring them since they had been in a fire. You said that you would look at them, but I know that you weren't prepared for the mess that I sent you. They were covered with soot and the electrodes were actually warped from the heat of the fire. I think even you had your doubts as to whether they would ever work again. I've now been using them for several months and they sound great! I told my wife tonight that the money I paid to have our Beveridge speakers repaired was the wisest investment that I had ever made in our stereo system. She replied that it wasn't as wise as having bought them in the first place. This newlywed couple bought a pair of speakers instead of furniture. I apologize for not posting a response to your message of 1/5/99 far sooner than this. Your words have been on my mind since that time. I certainly understand your passion for Beveridges and I want to share my experience of them. When my late husband and I were first married, here in Minneapolis, we mutually agreed that we didn't really care if we owned any furniture or not - that a really fine speaker system was the most important thing to us. We agreed we would go into debt to buy one if necessary. (I am a professional musician - piano and viola - and my husband was a psychologist/violinist.) As soon as we moved into our house, we set about finding our dream speakers. We used an audiotape of the two of us playing together, plus various other recordings we were very familiar with to try systems out with. Our third stop was at Hi Fi Sound here in the TwinCities. We had been reading about Beveridge 2-SW2's in "Absolute Sound", and were really curious about them. The store showroom was huge, with lots of wood surfaces. When I first heard our audiotape, I went into shock! Not only did I hear my husband's violin and my piano reproduced with absolutely accurate timbre, but I could "see" where he was standing, relative to the piano. We went on to audition orchestral and chamber music. The imaging was simply astounding. I remember being moved to tears at the wonder of it. We went home in a state of euphoria. Then we started thinking about the cost of it. Pretty soon the thinking set in: "What if we could find something nearly as good for a way lower price?" So we went all over the state auditioning other speakers. Nothing even came close. To make a long story short, we just said "To hell with it, we're going for it." Then we set about finding the components to go with the Bev's. We set the speakers up in the house, then A-B'd them by switching back and forth between Van Alstine's $150 modified Dynaco PAT5 pre-amp and Beveridge's own $2500 pre-amp. We were prepared, by then, to spend any amount to get the best sound we could. The Dynaco, however, won hands-down. To this day, it does a marvelous job. When the Bev 3 came out, we auditioned it. It was clean and clear, but its imaging never matched the 2-SW2 and it didn't seem able to reproduce any really big orchestra sound at a lifelike volume. The 2-SW's subwoofers (crossover at 100 Hz) have always sounded a little "tubby", compared to the crispness and fast response of the columns, but this has come to be a loveable fault. It seldom bothers me. As time went on, my husband and I used to nitpick about certain frequencies not coming through at the same volume on various recordings. Sometimes we would get irritable with the speakers and blame them. But when I now listen to CD's, instead of 33's and 45's, I realize even more how far ahead of their time these speakers have always been. With CD's, they really deliver up to their full potential. I never find myself fatigued listening to CD's. The speakers have "headroom" that makes the sound enter the room effortlessly and expansively. The soundstage of a cathedral is reproduced as easily as that of a tiny chamber music concert hall. And I never realized how capable they are of reproducing the entire dynamic range of the piano until I purchased recordings of 2-piano music on CD's. The speakers died about l988, 3 years after my husband died. I knew that Beveridges were no longer available. I could find no place in the area where I could contact someone about repairing them. I was told that "there was too much voltage across the plates, and that no one had the equipment to measure it." So, the speakers just stood mute in my music room. Then I met a tremendous cellist/engineer named Jim Haugland. Jim had read about Beveridges, but had never heard them. He volunteered to take on the task of restoring them. He found where to purchase the appropriate vacuum tubes, then replaced them along with other worn-out parts. I'll never know what else he did - but when he was through, they sounded better than ever!!!! I will be eternally grateful to him for this restoration. It has returned something invaluable to my life. In answer to how well they have held up since we bought them in about l980: Like I said, with their recent overhaul they sound better than ever. The wood of the cabinets is still beautiful. The grill cloth disintegrated years ago. I'm looking for suggestions on what to do about this. But, it's no big deal. I feel they are worth every penny we paid for them. All the time we were paying off the loan, we got to listen to them. And that was all the reward we needed! Having helped us in many ways (he designed our web site! ), Arthur finally has his own pair of Model 3s. My affair with the Beveridge speakers started more than 20 years ago. I was buying and selling loudspeakers, but was never satisfied with the sound produced. They were mostly electromagnetic type (cones) and I couldn't stand the sound. For a while, I built several speakers of my own, including elaborated transmission lines which some friends and a few recording studios happily bought - but no matter, the Quads of the time still sounded better in the mid and top range. I was fortunate enough to listen, some 18 years ago, to a System 3 in Israel (I now live in London). I knew then it was not the top of the range - a friend of mine in California owned a System 2-SW1 (much to my envy), which I never heard. Of System 2 I could only dream. I've been "in and out" of the hi-fi jungle for many years. I have listened to countless ESLs since (it's the only type of speaker I'm interested in; I gave up "cones" many years ago). All ESL manufacturers make various claims about sound quality. Very few are actually decent. Still, I have never ever heard anything before, nor since, that came close to that System 3. It was for me such an aural and musical experience that I cherish it to this day. In fact, I was so positively shocked and overwhelmed that I still recall the piece of music being played on an ARC pre-power and a Linn LP12 - Bizet's Carmen Fantasy. It was just ravishing. I often listen nowadays to ESLs with that System3 "memory" sound in my mind as a reference. I recall the presence, the detail, the lack of distortion, the clean, eminently musical sound - and that dynamic range! - that nothing I later compared had managed to equal. I don't know if it was mainly due to the ingenious "lens" system it employed, which dispersed sound in a unique way, or whether the drivers themselves were particularly successful, but I do know that it was the only "boxed" system I would happily listen to. Unfortunately, nowadays when I am in the position to fulfill that dream of mine and own a Beveridge, they are no longer available. All I can say is that it's a great loss to the music world (and to me). If you happen to know of anyone with a System3 in good shape who wants to sell, I'll be happy to hear about it. Meanwhile my best regards and heartfelt thanks for what I, and others who really have ears, consider the best, most musical and truthful loudspeakers ever made. I never owned a pair of Beveridge LS, but listened to one some years ago (18). It was a long audition and I went back for more. At the time, the price of that pair - a System 3 - was prohibitively beyond my financial resources ($9000). I dreamed of owning a pair for a long time. I still do. That System 3 was the best pair of loudspeakers I have ever heard. And I heard/owned/built many. I've been in the hi-fi arena for about 30 years. The first ELS I heard, some 35 years ago, was a pair of Quad 57. I subsequently heard them many times on various occasions and for many many hours. The first time I listened to them, they were playing Beethoven's 5th. The Quads were fed by 33/303 amps. That's how it is with me - when a sound system impresses me, I remember the occasion, the environment, and the piece of music being played, all very vividly. I can't help it, I'm an "ear" person. The first time I heard the System 3, it was Bizet's Carmen Fantasy being played through excellent ARC pre-power amplification, fed by a Linn LP12/SME player. That aural experience was breathtaking. I thought I could see and touch the orchestra in the (largish) room. I was, at the time, still experimenting with "cones", building transmission lines and the like. (I recall stacking a pair of Janzsen ELS tweeters in place of the Peerless domes on one such TL system - it didn't work). I was never satisfied with "dynamic drivers", it seemed it didn't matter how good/expensive they were, aural fatigue always set in at some stage. That first audition of the System 3 put a definite end to my longish flirt with dynamic loudspeakers. I never looked back nor owned one afterwards. After listening to the System 3, no other LS would do. When the Quad 63 came out, I rushed to listen to it. I was disappointed. They were clean and pure, but they seemed to lack the dynamics of even the 57's. They also had limited bass. Later, I listened to Acoustats, Martin Logans, Magneplanars. I bought a pair of the latter. They are not that good, but much better than cones. The most striking feature of all Beveridge systems must be, without doubt, the unique lens-loaded ES driver. Horn-loaded cones were made famous by Klipsch, in their various incarnations. I don't know if the lenses act like horns*, into how many sections they divide the driver and whether they act as "guides" for the acoustic waves to disperse**. The fact that all Beveridge systems are fully enclosed solves a doggy problem of all ESL designs, namely: rear cancellation waves. The lens system and the tall, vertical sound aperture also solves, to a large degree, one of the most uncontrollable variable in LS design - that of the room in which they play. I look forward to hearing from you. I've been, and remained, an exclusive Beveridge fan. Don't let Rick off the hook. Make him build more of them! *) I do now. They don't ! (if they were, I wouldn't touch them). In some models (e.g., the 2 and 2sw), the lens and the enclosure act as a Helmholtz resonator; in the others, they act as wave guides that form the unique wavefront dispersion. That was 4 years ago. Today Rick is a personal friend of mine. In due course, he managed to locate a pair of 3s and by now they duly dwell and make music in my house. The particular pair he got me has a unique history attached. They were the personal speakers of Harold Beveridge himself who, on Christmas 1980 presented them as a gift to his wife. Tragically, shortly afterwards Mrs. Beveridge had passed away. The speakers became the property of the "youngest" Beveridge - Ross ('re-designer' of the new Model 2 lens!) - who, sometime during his college years, sold them to a family friend, Dave Kaplan. It was from this friend that Rick "rescued" the pair for me. They are silver-finished and in absolute mint condition (inspected and guaranteed by Rick), save the cone woofers which had been replaced. Twenty years on the transducers are as good as new. I have since been "nuked" with astronomical offers to sell the 3's, but always had to disappoint the buyers. This pair ain't going nowhere; they've reached their final destination. By the way, if you read the Santa Barbara review of the Model 3, you'll see Bev standing next to the silver speaker, at home, where he was interviewed. That's the one. Theatre surround sound has become fashionable and I was intrigued to find out if the Bevs could be set up in this manner. For that, I needed another pair of 3's. So, about two years ago, I managed to locate one in Florida. Why the guy would sell them I'll never know, but I didn't ask too many questions, for fear he'd change his mind. Again, they are in mint condition; even the cones are original, with only their suspension foam having been replaced. They look gorgeous in their walnut finish and I can report that the four of them produce some breathtaking sound in my living room. But don't take my word for it. Just try to dream. and two evenings of "glueing". They make gorgeous music. The foursome, lined up for a photo session. The silvers are already mounted on castored tables - it makes it easier to move them around. The walnuts are in for similar treatment. Together they sing like nothing else (nighting_ales?) on earth. His Model 3s had been used by Dahlquist engineers as their reference standard. I can't begin to express how delighted I am to find the new Beveridge Audio web site. 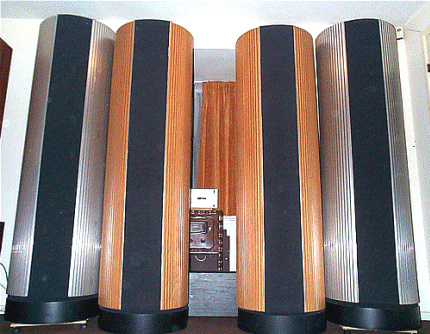 I bought my pair of System 3's at an auction several years ago, held at Dahlquist Speakers' old manufacturing site in Hauppauge, NY. After the auction was over, and as I was loading them onto my truck, I was confronted by the President of Dahlquist, who assured me that I would not be disappointed with their performance, and he was right. Apparently they were used for reference by the engineering staff. Although they are still working fine, the grille cloths have deteriorated. Do you have available, or know where I can obtain replacement cloths? Any input would be greatly appreciated. Rich first heard Beveridge (prototype) speakers in the 50's. After I hooked up my Model 2's to the renovated amps (complete with re-lubricated fans :-), I started to notice some problems. One unit had distortion that got worse as the volume level rose; the other unit didn't play at all. I made a run down to Bob Hoover's house and established that the amplifiers themselves were fine; the line sources, on the other hand, were obviously having some serious problems. Meanwhile, I had heard the performance of a pair of Rick's new line sources, as well as that of a pair that he had refurbished for Bob. Frankly, I would have asserted that Beveridges could not perform at that level, so I was _quite_ impressed. Knowing what my speakers _could_ sound like, I was very strongly motivated to get mine fixed up. So, when Rick said that he could refurbish my Model 2's, I took him up on the deal. My speakers are still pretty clean, and the second set of grill foam was never replaced after it disintegrated, so all we had to do in this stage was to remove the glue-laden aluminum border rails that bracketed each set of lenses. This required the removal of 26 screw assemblies (screw and cup washer) per cabinet, but a power screwdriver made short work of the job. This required disconnecting the transducers from their normal (parallel) wiring, then testing their electrical characteristics (e.g., mylar continuity, capacitance, and flopover voltage). Most of the transducers, predictably, had lost some mylar tension, resulting in low flopover voltages (e.g., less than 4 kV); a few had corrosion near the mylar contact area and/or capacitance imbalances (in terms of Rick's new, more stringent requirements). Each of the six transducers was bolted in by 12 fastener assemblies (nut, lock washer, flat washer, and bolt). No power screwdriver was coming within sight of these babies; I removed each one by hand! Many of the bolts were recalcitrant, but persistence paid off eventually, with all six transducers sitting in a rack, individually enclosed in numbered plastic bags. I should note, in passing, that my set appears to be the seventh set of production Model 2's, using the original "resin rims". re-evaluated the electrodes (against a sheet of stretched mylar), looking for capacitance or voltage-related issues; any problems were repaired as they emerged, so clean sets of electrodes were (eventually) produced. re-assembled the transducers, stretching and gluing in a mylar sheet, putting back the bolt assemblies, re-testing the electrical characteristics (just in case), etc. The original fabrication technique relied solely on the bolts to clamp the rims together on the mylar; Rick now adds occasional dots of super-glue on _one_ electrode rim (between the bolts) to prevent mylar slippage. At the end of this stage, the rebuilt transducers were again sitting in their numbered bags in the storage rack and it was time to get back to the cabinets. The original Model 2 cabinets were, apparently, intended to act somewhat like the shell of a string bass. That is, the walls of the cabinet were not made solid (or even very stiff); rather, they were expected to vibrate. Although this produces a mellow, diffuse bass boost, it does really awful things to the accuracy of the lower frequencies. Rick proposed that we seal up major air leaks and stiffen up the critical portions (e.g., fronts, sides, and backs) of the cabinets. He also proposed that we stiffen up the outer two "wave guides" of the lenses. Having heard Bob's renovated 2s, I was quite eager to have this done. The actual work was pretty mundane; we pushed epoxy putty into the gaps between the lenses and cabinet fronts, inserted (dozens of) glued sticks into strategic places, and coated the outside of the lenses with a sand-filled polyester-resin "mortar". Whereas the original coating (sand-filled automotive undercoating) damped the vibration of the wave guides, this mixture makes them totally rigid. Considering that the air pressure in the "neck" of the lens is about ten times that at the electrode, this is quite important. Well, as I ran out of visiting time, I don't yet know. Rick is still working on the cosmetic touch-up, so I won't get my line sources back for a few more days. By careful filling, sanding, and painting, Rick hopes to make the cabinet's lens fronts quite presentable, even with no grill foam. In any case, I hope to have the renovated systems playing in a week or so. I will then post a note (Part 2) telling the list how the speakers sound, look, etc. If you live near the San Francisco Bay Area (or are around for a visit), I'd be happy to have you come over and listen to them (please call first :-). I don't have Bob's level of drive electronics, but I still think you'll be amazed at the clarity and sound levels of refurbished Model 2's. If you decide that you, too, can't live without the renovation, send Rick a note. He is ready to take on as many of these jobs as he can; good-sounding Beveridge systems are his best possible advertisement! The cosmetic issues and some re-engineering of the mylar connection scheme took Rick a couple of weeks to finish. Finding time to listen carefully to the systems has been a bit of a challenge; finding time to write this note has been another. In any event, the refurbished Model IIs are happily ensconced in my living room. I have listened to several favorite CDs on them (e.g., Joni Mitchell, PP&M, Christopher Parkening, and Dave Brubeck) and am pleased to report that they are vastly improved. The most noticeable area of improvement is dynamic range. They now play louder than _I_ find comfortable, so I won't be hitting any real limits in actual use. For test purposes, however, I ran them up to the point where the amps started to distort. As expected, the transducers had no problems at all with this; as noted in Part I, Rick had stress-tested each of the electrodes up to 5 KV, fixing any hot spots he detected. So, they're solid! I'd wind it 'round and 'round. Careful Reader will realize that most of the material I have been trying out is vocal. Part of the reason for this is my own taste, but there is also an analytical motivation; voices are hard to reproduce well and humans are very good at knowing what voices "should" sound like. In any case, the refurbished speakers are reproducing vocal music like a charm. In fact, I have been able to understand some words that have been eluding me for years. As I can't imagine that my hearing has somehow gotten better (:-), this must have to do with improved sound from the speakers. I also find that some old songs seem to have renewed emotional "punch". I think this is because accurate reproduction enables me to "connect" with the singer's sincerity, but that's only my naive theory. The bottom line, however, is that the music grabs me more than it has in years. Oh, yeah; the cabinets. Rick did a light refinishing job on the (walnut) cabinets, making them glow as they haven't since I got them. He also worked for several days on the lens fronts, making them look as if they were _supposed_ to be seen. This is in line with his practice on the new models, but bringing the old ones up to snuff is a LOT harder than simply making them look nice in the first place. I can't guarantee that your speakers can look showroom-ready again, but I am quite willing to predict a very noticeable improvement in their appearance, regardless of their current condition. I would also be willing to predict that you will be stunned by the sound they will make, if they (like mine) have been just "limping along" with loose cabinets, faulty connections, loosened mylar, etc. A passionate audio engineer, Bob gave us extremely useful feedback and advice. I have been a follower of the Beveridge loudspeaker design since I first heard a pair of Model 3's in the early 1980's. This year, a friend of mine found a pair of Model 2SW's for sale, which I decided to pursue. For years, I have been a happy owner of a Pair of KLH Model 9 full-range electrostatic speakers. I have been using a Wadia 27/270 CD transport/DAC, directly driving a Futterman OTL amplifier as my electronics complement. Since the Wadia has an integrated digital volume control, no preamp is necessary. I have very much enjoyed this arrangement and was not really interested in changing it, even though the KLH 9's are notoriously hard to set up correctly and demand fairly well controlled room acoustics. The KLH 9's use the traditional electrostatic dipole transducer, which creates an out of phase sound wave from the back of the speakers. The "speed", lack of distortion, and overall fidelity of the KLH 9's are legendary. When I heard that the Beveridge 2SW's were available, I was curious, since I was so impressed with the Model 3's that I had heard. I took the plunge. I was not disappointed. The sound was more full range than any other electrostatic I had heard. The subwoofers give pretty well integrated bass and the main line source drivers have ease of placement and incredible dispersion. After a fairly short refinement process, I was happy using these Beveridges as my main system. A little while after getting settled in with this system, I found a pair of Beveridge Model 2's that were available for sale. I was again curious as to the differences, since I had heard that the Model 2's were the most "pure" of the Beveridge designs. I decided to give them a try. I was very favorably impressed with the overall improvement in the fidelity of the sound. Measurements agreed that these were very accurate loudspeakers. The biggest issues I found were that they did not have deep bass and would not get as loud as the Model 2SW's. The Model 2's now became my principle loudspeaker. In the process of acquiring and working with these speakers, I became friends with Rick Beveridge. He has spent the last few years resurrecting the manufacturing processes needed to make new pairs of Beveridge Model 2 speakers from scratch. I have been working with him though this process and have been amazed at the quality of craftsmanship that he has been achieving with the new speakers. I was very fortunate to be one of the first listeners to his first Model 2 speakers. I was very impressed with the improvement of definition, detail, and extended bass that was produced by the new speakers. I decided to have Rick rebuild my Model 2's to the same standards that were used to make his new ones. The results were remarkable. He was able to transform some very good loudspeakers to a new level. The main improvement is the increased definition, detail, and solidity of the sound. I have always been impressed with the low coloration of the 2's and the amount of music that is revealed with these speakers. They have an amazing amount of life, detail, and musicality. Now they have more accuracy and an almost analytical quality to them. Much of the subtle coloration that was present in the original Model 2's is gone. The intricate details that could be heard before are now clearly delineated, with less question as to their accuracy. The speakers are now much faster sounding. They have much more immediacy. I do not know if they have surpassed the KLH 9's in this respect. The 9's are some of the fastest speakers that I have heard. They are second only to plasma loudspeakers, from what I can tell. The most frustrating side effect of the new upgrade is that now there is an even greater need for quality in both source material and drive electronics. One hears everything that is going on with this upgraded speaker. I am used to this and I have gotten very picky with both parts of the source stream. I expect I will be working even harder to improve this part of the system. In many other cases, the result of "extra" definition is an edginess that the sound exhibits with this new "detail". This is not the problem here. The speakers are not edgy. What I have found is that very good electronics sound very good. Less performance in the source signal makes the speakers sound more like many other high-end systems. These speakers can sound much better than people usually experience, even with some of the most expensive systems. The challenge for me now is to get electronics that reach this rare level of performance. Do not expect these speakers to be the principal limiting factor in the fidelity of a system. Rebuilt the transducers. This matched the transducers and improved the overall high frequency response of the speakers. Stiffened and added more mass to the lens horns. This gave the most dramatic improvement to the definition of the sound. It also improved the bass. Stiffened the face of the cabinet. This reduced a major source of coloration. Stiffened the sides of the cabinet. This also reduced the coloration. Sealed the air leaks around the lens. This helped improve the definition, since the only sound now emanating was coming from the "lens" of the speaker. Removed many rattles and resonances in the wood frame of the cabinet. The bass is much cleaner now, since it does not stimulate any rattles or other sounds. Added static discharge conductors to the inside of the cabinet. This is a feature that was added to many of the production speakers, but was not present on mine. It keeps the speakers from periodically "popping" from static buildup. So what are the negative issues resulting from the upgrade? The primary one is that the bass is more extended and, as a result, more resonant. This comes from the cabinet now being stiffer. The original flexing of the cabinets made them seem acoustically larger. With the new stiffness, they resonate at a slightly higher frequency. Many people will feel that the speaker now has more bass. This is true. It also has more bass definition. This effect was amplified when I added an extra stiff rear panel to my speakers. The end result was an even more pronounced resonance, which moved up to 60 Hz. I was able to correct this with some simple equalization, which removed this hump. Because of the damping in the speaker, this resonance is broad and not very loud. As a result, the EQ trick works pretty well. The advantage of this additional back panel stiffening is major. First, the bass goes much lower in frequency and is much better defined. Second, the dynamics of the speaker are greatly increased. This can be heard as a new "life" to the sound. These speakers really like to "jump" with the dynamics of the music. There is no hesitation or softness now. I never get tired listening. Every piece of music is so happy to be playing. This was one of the last hidden issues that I found with the Beveridge "sound". It is very good, but could it get better? Now I know it was this lack of dynamic life that was coming from the cabinet flexing. It is now a real joy to listen to music for days and days without tiring. The big challenge with all of this is to remove the new bass resonance. Good quality EQ seems to work fine. Several people that I have talked to use Model 2 speakers with a crossover that switches the sound reproduction to a fast subwoofer around 60 Hz. Doing this gives the system several dB more volume, with very powerful bass. I recommend this back stiffening for anyone who is running the 2's in a crossovered system. The added definition in the bass is very impressive and accurate. In general, I could not be happier with these speakers. As I mentioned, more enhancements are also being worked on in the electronics. I am now running with some amplifier improvements and the combination of all these upgrades has impressed several jaded audiophiles who have come by recently. In addition, many people who thought they could not discern a "hi-fi" system have mentioned that the realism that is produced by this system was something beyond what they imagined would be possible. This has become a very special music re-creation system. Over the past 15 years or so, I have had the good fortune (as a part time hobbyist and as a collector of vintage tube era audio gear) to own and to listen to a great many classic pieces of equipment and hear how they interact with various speaker systems. Eventually, this led to me building my own single-ended triode amps and becoming a mercenary for vintage Alnico and horn speakers. I have had quite an impressive collection over the years, all of which has eventually been traded away in pursuit of the elusive, and soon to grow tired of, next system with "better sound". An acoustician/audio consultant friend of mine once told me that, as audiophiles start to "mature", they eventually migrate over to electrostatics. Taking notice of his comment to me, this started the next phase of my audio endeavors. 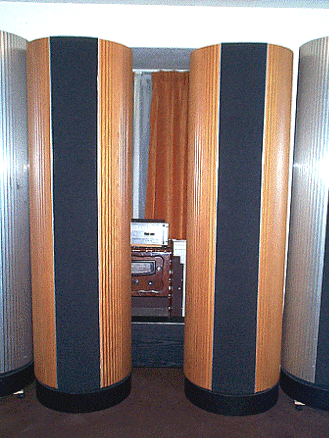 Two of my favorite systems from those days were a stacked pair of Quad 57's and a paralleled pair (four) KLH 9's. Hard to beat, even today. I was aware of Beveridge speakers, but never had an opportunity to see or hear them in person, as they were always considered very rare. One day, I saw an ad in the local paper. Someone was offering a pair of 2sw's for shamefully little money. It was already well past the time the paper had hit the newsstands, but I figured "What the heck?". I called and, to my surprise, the seller still had them. He had already been flooded with at least a dozen calls from audio dealers, offering to buy them. This fellow was an eccentric sort and refused to sell the speakers to dealers or anyone else who would not "appreciate" them. After meeting with him and assuring him of my pure intentions, I became the proud owner of a pair of Beveridge speakers! The sound from these Beveridge speakers was more than a pleasant surprise; it was a revelation. I had never heard that level of detail and speed. I had also never seen a stereo image of such depth, without the conventional "head vise sweet spot" that most electrostatics have. Albeit the amps were tired and noisy and needed to be rebuilt, which I did myself. (Do not fuss with these amps, if you don't know what you are doing, as they are potentially very lethal!) They played beautifully in their factory-original form for a few years until, eventually, one of the electrostatic panels needed some attention. During this time, Rick Beveridge put up his web site and was rebuilding the older speakers and building brand new ones. Over the next few years, I acquainted myself with Internet newsgroups about Beveridge speakers and read other testimonials from Bev owners. I eventually decided that these speakers were not only worthy of a complete rebuild, but that they would probably be the last speakers I would ever own. I called Rick; he was very happy to hear from another Bev owner. I decided to have all six panels rebuilt. When Rick first contacted me (after I had sent my panels in), he informed me of the extra work he would have to do to get them "just right". There were some slight variations in the production methods used during some of the original production runs; this made rebuilding my particular panels a challenge. I assumed that the work involved would be too time consuming and Rick would not want to do it, but I was very wrong. Rick was like a Pit Bull, not letting go until the panels were all perfectly matched. I have never met anyone as obsessive about detail over audio work as I am, until Rick Beveridge rebuilt my transducers. I have also never been so valued as a customer. During this process, Rick informed me how to go about updating the cabinets and stiffening them in strategic places. I also took this opportunity to further update and modify the amplifiers. This included, among other things, bypassing the original built-in crossovers and subwoofer amps. I also replaced the original closed-box type subwoofers, in favor of some huge 8' tall transmission lines that I built from scratch. In their original 1970's stock form, my Beveridge speakers were amazing. But, in my humble opinion, they were functioning at considerably less than what they were truly capable of, given today's more sophisticated materials/components and Rick's know how. After all of the work, my speakers sound light years beyond anything I have ever heard. P.S. As seen in the photo: Beveridge 2SW speakers. The analog drive system includes an Audio Research SP10 preamp, an Oracle Delphi turntable, and a Marchand XM26 tube crossover, built from a kit. The digital portion is a California Audio Labs Alpha and Delta. The interconnects are all DIY Belden 89259 coax. The subwoofer amps are Apex Seniors. There is also a DIY line filter from an old Sound Practices article. The transmission-line subwoofers, on either side of the fireplace, are 8' X 12" schedule 40 PVC pipe, with Peerless XLS 12" woofers, firing down at the floor. I am the "Beveridge System" believer in Japan. It is doing assistant with High-End Audio-shop and met "Beveridge System 3". (It is the case of 20 years ago than now.) Many problems occurrence, although I possessed "System 2" "System 5", after that and let go of them. However, it is not forgotten inevitably, because it is doing love in, "Beveridge System 3". Now, a some used selling agent in about $4000-with "System 3", is being offered for sale. (the photograph, references.) Seeing these photographs problem can discover, to " lens / ESL-unit / front grill " each. Thereupon, I ask the estimate of case that constructed this "System 3" to, you with the following specification. I do, arrange the round trip transport between Japan and U.S. with this one. (4) Overhaul of "Network", "Transformer". (5) Packing at the incidentally of return. I am not a wealthy Audio freak. However, there is unusually zeal. Please, give the answer to my hot thought.